All CGNS files are stored on GitHub (https://github.com/CGNS). Issue tracking is located at: https://cgnsorg.atlassian.net. Although there is no registration requirement in order to obtain CGNS, by registering you will help the CGNS team to serve its users better. We never give, sell, or distribute emails to anyone. We also strongly recommend that you join the Discussion Group. This forum is the primary method used to keep CGNS users current with release and other important information updates. It is also used for discussing important problems/issues and for obtaining help from other CGNS users. First and most importantly, we recommend that you read the CGNS User Guide. This guide also includes sample code (UserGuideCode) for helping to get started with CGNS. For the up-to-date development source, visit GitHub Development. For the stable source, visit GitHub Stable. In addition to numerous bug fixes, this version added new features: CPEX 40 Rind Plane Indexing, CPEX 41 NGON modification proposal, added support for NAG Fortran compilers, enforce the HDF5 version >= 1.8 is used in building HDF5, automatic detection and linking of szip and zlib if required by HDF5. This Version is mainly a bug fix maintenance release. This release also addressed Fortran Windows support for both serial and parallel versions of CGNS. This Version implements CPEX 0038 and 0039, adds new functionality to the parallel capability, and makes extensive changes related to the Fortran library. Important note for Fortran users: V3.3 removes the usage of "include cgnslib_f.h". Instead, from this release forward, one must now employ the module "use CGNS". Also, if making use of 64-bit integers, Fortran programs must declare the relevant 64-bit integers via, e.g. : integer(cgsize_t) integername. This Version 3.2 release provides partial integration of parallel I/O using HDF5 with MPI. It also implements the Hierarchy of families (CPEX 0033), Multiple families (CPEX 0034), and Cubic elements (CPEX 0036). Conversion programs to and from AFLR3, FAST, and TetGen have also been added to CGNStools. Release 3.2.1 implements the suggestions by Cambridge Flow Solutions to the CMake scripts and adds routines to set the MPI communicator for parallel I/O. There are also numerous updates and fixes to the test cases, tools and CGNStools utilities. Note: CGNStools is no longer built automatically, you need to set the configure flag, --enable-cgnstools if using configure. Older recent release versions are also available from https://github.com/CGNS/CGNS/releases. Even earlier releases can be found in the archives: https://github.com/CGNS/CGNS_archives. UserGuideCode - examples from the CGNS User Guide. NOTE: CGNS has switched from SourceForge (http://sourceforge.net/projects/cgns) to GitHub (https://github.com/CGNS). Issue tracking is located at: https://cgnsorg.atlassian.net. NOTE: if building CGNS with an HDF5 version earlier than 1.8, then links will not work when using HDF5 file type. When using HDF5, it is currently recommended that CGNS be compiled against the HDF5 1.8.x library. 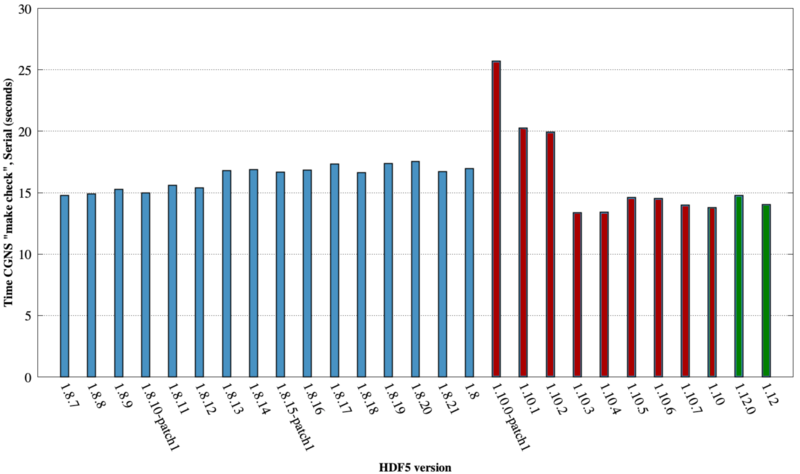 The following figure shows the typical performance of CGNS "make check" for various versions of HDF5 for serial I/O. Users should be aware that many new features in CGNS require the use of up-to-date compilers. For example, older FORTRAN compilers that are not FORTRAN 2003 compliant (such as g77) will not work for many CGNS features, and are not recommended or supported. which describes some of the reasons for upgrading to the latest version 3 software as well as how to handle portability issues between versions. Compression currently does not work for CGNS.